Our skin does not exfoliate at the rate it should, leaving oxidized, dead skin cells lying dormant on the skins surface. These skin dead skin cells clog pores and can cause acne. They also leave the skin looking dull and dry. Below are a few of the treatments that Healing Springs offer to help with your skin care needs. Microdermabrasion is one of our most popular skin treatments. This procedure is done by one of our licensed facial technicians. It consists of a deep cleansing of the face and a diamond tip to help exfoliate the dead skin cells off the skins surface. This treatment is used to improve the appearance of acne, fine lines, acne scars and wrinkles. This procedure has no downtime. There may be some redness for a short time after the treatment. Glycolic Acid is another service that we offer with little or no downtime. It consists of a deep cleansing of the skin after which a glycolic acid of 30% is applied to the face. This procedure also exfoliates dead skin cells leaving your face looking brighter. This is a great treatment for acne, fine lines and hyperpigmentation. 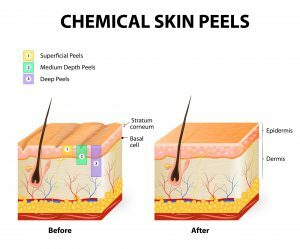 DermaPeel is a combination of the Microdermabrasion and a Glycolic Acid resulting in an exfoliation of the skin and pore reduction. Obagi Blue Radiance Peel is a treatment that uses a unique blend of acids to provide a gentle but effective peel, resulting in tighter smoother and brighter looking skin immediately after 1 use. It is a Salicylic acid-base and helps improve a range of skin conditions such as acne scarring, photodamage and melasma. This peel can also be used to address sun damage on the neck and décolletage. Jan Marini Refine Peel is the less aggressive of the Jan Marini peel series. It contains lactic, salicylic and citric acids. It is excellent in providing overall skin rejuvenation and helps with fine lines and wrinkles, mild acne and light pigmentation with less peeling and downtime. Jan Marini Clarify Peel is a combination of salicylic and mandelic acid. This peel is more aggressive than the Refine Peel. There is more peeling in this peel which helps more with the acne scarring and pigmentation problems. Jan Marini Transformation Peel is the most aggressive of the three Marini Peel Systems. This peel actually has 3 to 4 days of downtime. It also is a wonderful treatment for acne scaring lines and wrinkles, photo damage and overall rejuvenation. Along with these treatments we suggest a variety of skin care products that help maintain and accelerate the cellular turnover of the skin. Schedule a consultation to see what peel will work best to address your concerns!